Thyroid gland is an organ located in the lower neck in front of the the windpipe (trachea). It has a two main lobe, right and left thyroid lobes, each located on one side of the windpipe. This gland produces thyroid hormone which is a very important hormone in controlling the body’s metabolism. Too much thyroid hormone causes the body to burn too many calories and run “too fast” creating symptoms of weight loss, palpitations, anxiety, tremor, nervousness, feeling too hot (or being sensitive to heat), difficulty sleeping. Thyroid goiter is a condition of significant enlargement of the thyroid gland (often due to extreme growth of one or more nodules) that may cause lump in the neck that is easily felt or even seen. At times a thyroid goiter can press on windpipe (trachea) and cause narrowing of the airway and problems with breathing or press on feeding tube (esophagus) and cause swallowing difficulties. Most common treatment for a thyroid goiter is the complete removal of the thyroid gland (thyroidectomy). Use of modern technology and skilled hands, minimizes the risk of injury to these important structures. Dr. Oliaei uses specialized electromonitoring system that continuously monitors the laryngeal nerves and warns him when he is dissecting close to the nerves thus helping him avoid injury to the nerves. Additionaly, use of special ultrasonic dissection tool (Harmonic Focus Instrument) minimizes bleeding which keeps his surgical field clean and his dissections more accurate. Often times, minimally invasive techniques are used in thyroid surgery that allow use of a very small incision to deliver the entire thyroid gland (hence a very small scar in the neck). Endoscopes are at times use to assist in minimally invasive thyroid surgery. Robotic thyroid surgery is thought by some to be a minimally invasive form of surgery. This method avoids a scar in the neck at the cost of a large (often greater than 4 inches) and involves the creation of a underskin pocket from the armpit to the neck. There has been reports of injury to the nerves of the arm (brachial plexus) with this technique and the FDA is re-evaluating this surgical technique. Some have also questioned the increased costs of this surgery (~double the cost of traditional thyroid surgery without improving the treatment of the disease). Dr. Oliaei does not routinely employ this technique despite significant training background with robotic surgery because of the above concerns. For an appointment to discuss various options for thyroid surgery, please click here. The surgery is performed under general anesthesia and depending on if the entire gland or part of the gland are removed it can last anywhere from 1-4 hours typically. Most commonly the surgery is performed on an outpatient basis with less than 24 hour monitoring in the hospital after surgery. Expect to have about 1 week and occasionally up to 2 weeks of recovery time. Major risks of surgery include injury to the nerve that moves the vocal cords causing weakened voice or rarely difficulty breathing, drop in calcium levels requiring calcium supplementation, bleeding and infection. As a general rule the size of the incision for thyroid surgery can range from around 2 inches to 4inches or more depending on size of the thyroid mass and the extent of the surgery. Scarring depends on your genetics but it can be minimized by keeping the wound clean, preventing it from drying out (use of ointment or skin glue) and keeping it away from the sun. Calcium is an important mineral that helps with many of the body’s functions such as building of bones and the movement of muscles. Without it, these functions are not possible. However, too much calcium (aka hypercalcemia) presents many problems of its own. The most common cause of hypercalcemia is excess of parathyroid hormone. This hormone is typically produced by four small parathyroid glands that are located in the neck and is important is maintaining calcium levels so that your body can continue to function appropriately. Excessive production of parathyroid hormone by the parathyroid glands is called hyperparathyroidism and it often leads to excess calcium levels in the blood. 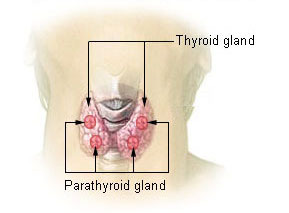 Parathyroidectomy is a surgery to remove abnormal parathyroid glands. It is frequently performed to treat hypercalcemia and hyperparathyroidism. In most cases, this surgery is a curative surgery. In majority of cases removing just the abnormal parathyrid gland (adenoma) while leaving the other four glands can cure the disease while maintaining the normal functioning glands. To identify the abnormal gland and preserve the others, several diagnostic studies can help. Most frequently a sestamibi scan in which special radioactive tracers are used to identify the abnormal gland is used. Ultrasound study of the neck and MRI can also be helpful to confirm the sestamibi scan findings. Once the offending parathyroid gland is identified, surgery can often be undertaken in a minimally invasive fashion targeting the offending gland only. Rapid assessment of parathyroid hormone level during the surgery and rapid “frozen-section” assessment of the removed gland prior to completion of surgery can confirm the success of the operation. During the surgery, the nerve of the voice box (recurrent laryngeal nerve) is located close to the parathyroid glands and is at risk for injury. Modern nerve monitoring technology allows safer operations by help to avoid injury to the nerve. Parathyroid surgery is often done on outpatient basis with same day discharge from the hospital. Recovery may take up to 7 days and often calcium supplementation is used for two weeks after surgery while the normal parathyroid glands resume their function. Thyroid and parathyroid surgery can be done safely with use of modern technology by skilled surgeon. Ear nose, throat surgeons are the most adept surgeons at operations within the neck, having the experience of surgery in the neck for other forms of cancer and congenital and benign lesions. Ear, Nose Throat surgeons have experience identifying and preserving vital nerves and other organs of the head and neck due to their specialized training. In addition, ENT surgeons have greatest knowledge in terms of how to manage complications from thyroid and parathyroid surgery such as vocal cord paralysis and airway difficulties. Vocal cord paralysis can occur from surgery in the neck but also can result from growth of tumors in the neck, viral infections and various forms of trauma to the throat. The result is often a breathy or hoarse voice when only one vocal cord is paralyzed. When both vocal cords are paralyzed, the result can be more significant and cause difficulties when breathing. Fortunately permanent vocal cord paralysis can still be treated with good functional results. Vocal cord injections with temporary filler material such as hydroxyappatite, collagen, or hyaluronic acid can restore the voice. Permanent reposition of the vocal cord (thyroplasty) is also an option. If you suffer from voice changes or breathing difficulties after thyroid, parathyroid surgery or after endotracheal intubation for other surgeries, you may be suffering from vocal cord paralysis. Seek consultation with an Ear Nose Throat surgeon for evaluation and treatment.